I’ve been designing the festive windows and in store styling of Queen Bee, a local hair spa/beauticians for a couple of years now. 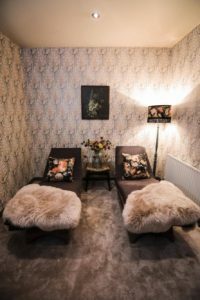 I have a lovely relationship with the salon owner and was thrilled when she asked me to help her with the re-design of two of her treatment rooms as well as a client lounge area. The existing scheme was mainly beige, cream and grey with dark wood and chrome fittings. 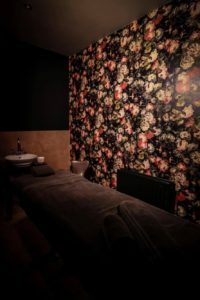 The treatment rooms are mainly used for massage, facials etc and as such I wanted clients to feel super relaxed whilst receiving their treatments, almost cocooned. Personally I often find beauty salons to be very light spaces, some almost clinical and cold, something I specifically wanted to avoid here. The salon owner was keen to push the boundaries and go for something different. After some fact finding and research I proposed a dark scheme. House of Hackney’s Midnight Garden was my starting point. 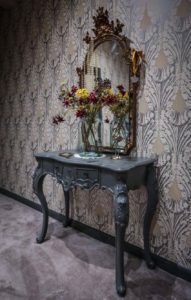 This beautiful and luxurious dark floral wallpaper, reminiscent of Dutch old master paintings was chosen for feature walls in both treatment rooms, this was teamed with Farrow & Ball’s Studio Green, a dark inky green which perfectly complemented the botanical print as well as the terrazzo tiles on the walls and floor. This would be used on the remaining walls and on the woodwork. Farrow and Ball’s Hardwick White was chosen for the ceilings. Only one of the treatment rooms had a window, a local company Istitch provided a bespoke roman blind in Warwick Fabrics Husk fabric, the perfect match for the Studio Green wall on which it was fitted. 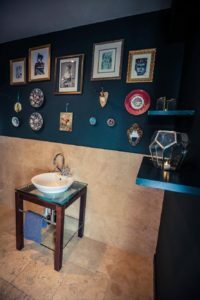 A collection of flee market finds and vintage and modern prints were hung on mass to create two gallery walls, other accessories were kept to a minimum as we didn’t want the rooms to feel busy. 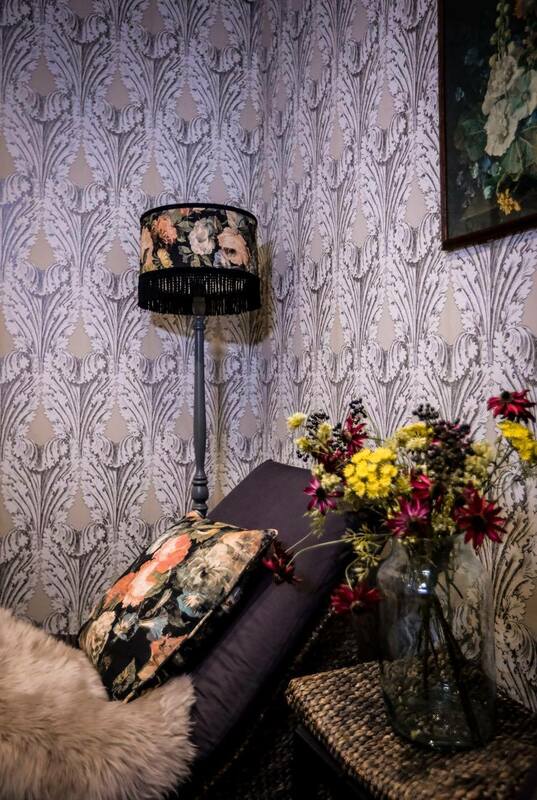 The relaxation lounge area already had the most beautiful Osbourne and Little wallpaper from a previous makeover. The owner was still very keen on it and I felt that it could work very well within the shame had planned. To make the lounge more cohesive I chose to switch the cream woodwork for Farrow and Ball’s Downpipe, a lovely dark grey that would hint t the darker interiors which could be expected once clients moved from the lounge area, situated on a landing, into the treatment rooms. A beautiful mole coloured carpet was chosen to replace the existing beige one. 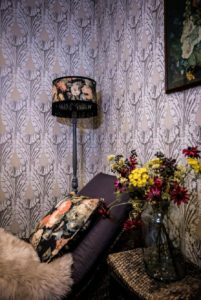 As we hadn’t used Midnight Garden wallpaper in the lounge I let it was important to introduce t somewhere, large bespoke cushions were made from Midnight Garden linen mix fabric. These were used on the loungers, accompanied by mink coloured sheepskins for a luxurious look and feel. An existing dressing table was given a new lease of life with a coat of Downpipe, as was a vintage standard lamp. 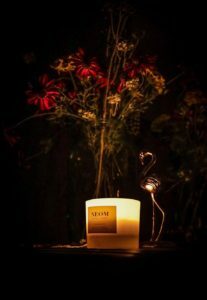 Midnight Garden linen was also used to make a bespoke lampshade for the lip, trimmed with a deep tassel in black this piece rally makes an impact. 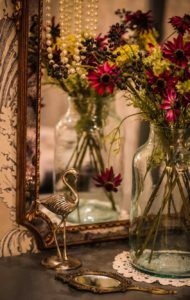 A large vintage pickling jar vase from the Anna’s Attic homewares range was used to display faux blooms. A mix of purple cosmos, berries and other such loveliness that I was so surprised but thrilled to find on offer at my local Dunelm store. 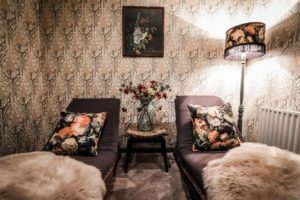 I’d spent many weeks sourcing items for the gallery walls on this job, all the time keeping a look out for the perfect Dutch old master to go above the loungers, to further hint at what was to come once clients entered the treatment rooms. I did find several perfect examples at Violet & Thistle, sadly they were too small, I could have gone for a pair but my preference was a larger scale, hung centrally on the wall. Two weeks into the job and finally I managed to track down a beautiful vintage piece, a 1960s reproduction, hand framed in a lovely dark wood – Bingo. I’d round the perfect final piece of the puzzle.